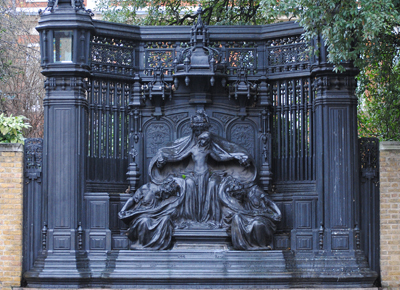 Erected to the memory of Queen Alexandra, the consort of King Edward VII, the memorial – an ornate bronze screen – is located on the exterior of the garden wall of Marlborough House – the Queen’s former home – in Marlborough Road, opposite St James’ Palace. The now Grade I-listed bronze memorial, which is the work of Alfred Gilbert and was erected in 1932, is sometimes described as London’s only Art Nouveau statue. It depicts a central figure, described as “Love Enthroned”, supporting a young girl (perhaps a symbol of the Queen’s support for the next generation), and attended by two crowned bowing figures which it’s believed represent faith and hope. 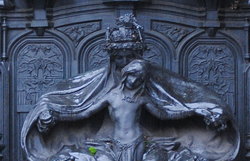 An inscription – “Faith, hope, love – The guiding virtues of Queen Alexandra” – sits below. The memorial was unveiled on 8th June, 1932, with the Archbishop of Canterbury, Cosmo Gordon Lang, in attendance. Queen Alexandra’s Memorial Ode, composed by Sir Edward Elgar, was first performed at the ceremony. The memorial was the last public artwork to be completed by Gilbert, noted for having also created what is arguably London’s most famous statue – that of Eros in Piccadilly (see our earlier post here), who was knighted by King George V after the unveiling. The Queen lived at the property during her widowhood until her death in 1925. Apologies – we neglected to put in the link! Now corrected. It is interesting that the memorial was unveiled in 1932, right in the middle of both the Depression and the Art Deco passion. I know it harks back to Queen Alexandra’s Art Nouveau era, so I wonder why it wasn’t built in 1901.